Perhaps the most shocking allegation against George Zimmerman has been that he "profiled" Trayvon Martin, as can be seen by the 103,000,000 Google hits that search generates. The mayor of New York City, billionaire Michael Bloomberg is similarly accused of having his 44,000-officer New York Police Department racially profile black and Hispanic youths (a.k.a., "the right people") to be stopped and frisked. But the Bloomberg profiling controversy, such as it is, has generated almost 100,000,000 fewer web pages than the Zimmerman profiling controversy. And rightly so. 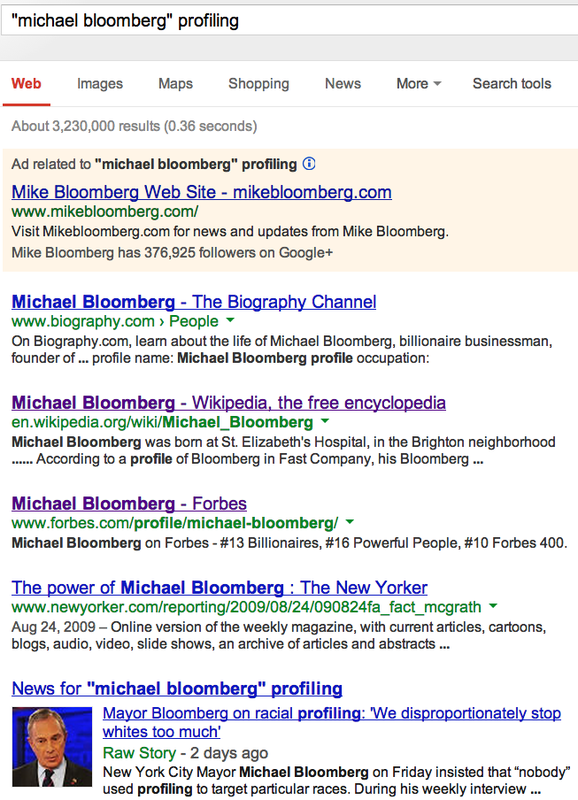 After all, this Bloomberg person is just some provincial nobody with a crimefighting complex. He's not George Zimmerman. Let's keep our priorities straight, people.